My sister in law came to visit this weekend and I found myself looking for a quick and easy pudding to whip up in her honour. 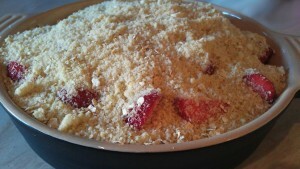 Having a hunt around in the fridge I found the ingredients for this really easy rhubarb and strawberry crumble. A delicious bowl of comfort food served with vanilla ice cream. The rhubarb and strawberry work really well together with the strawberries supplying the perfect counterbalance to the tartness of the rhubarb. Pre-heat your oven to 200 degrees C, gas mark 6 or 400 degrees Fahrenheit. 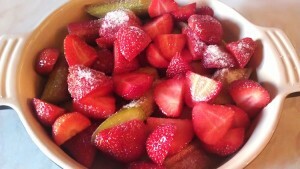 Take your pie dish and add the rhubarb pieces and halved strawberries. Then sprinkle with a tablespoon of caster sugar and the orange zest. Give these a gentle mix together. 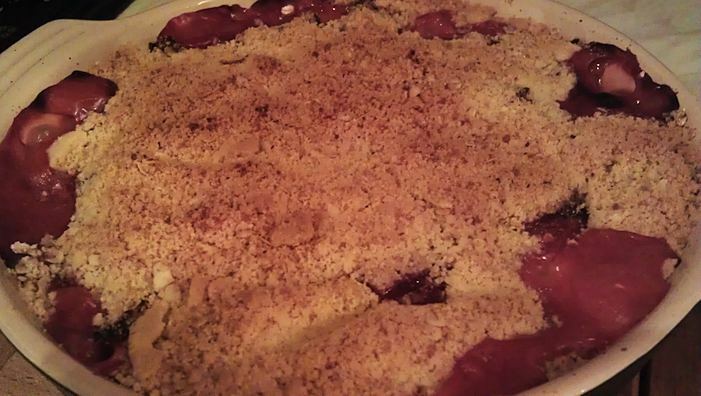 Next you need to make your crumble. By far the quickest, easiest and least messy way to do this is in a food processer. Simply add you flour and butter (chopped into small cubes) and blitz together until you have a mixture resembling breadcrumbs. The other way of doing this is by hand – place the flour and butter in a bowl and rub together the mixture using your finger tips until you have a crumbly texture (slower but also very satisfying). When you have achieved a crumbly texture add your oats, demerara sugar and flaked almonds. Gently mix this into the crumbs using a spoon until you have a nice even mix. Evenly sprinkle this topping over the fruit and then place in the middle of the oven to cook for around 25 to 30 minutes. You want the fruit to be cooked through and oozing at the sides of your crumble, and the crumble to be a nice brown colour and cooked through. When ready, remove from the oven and serve immediately with a generous scoop of vanilla ice cream. 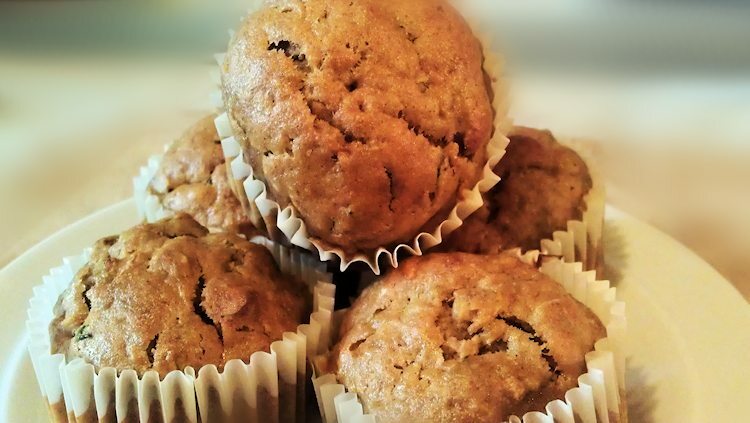 Ok, here’s my first recipe – carrot and courgette muffins – a nice simple one to start with. This is a really easy recipe and can be whipped up in a jiffy. Welcome to my shiny new blog “lovely buns”. Here I want to share with you my forays into the world of baking – a world of bread, cakes, biscuits, buns and anything else that is very likely to thwart my effort of ever achieving the perfect bikini body (an idea I gave up some years ago after discovering my love for baking). I hope to bring you my baking successes and failures and help inspire you to get into the kitchen, get out your best mixing bowls and whip up some tasty treats to share with friends and family. I would also love to hear from anyone who has a baking recipe or experience they’d like to share with other readers of this blog. It’s all about sharing the love of baking. Welcome to Lovely Buns. A site dedicated to thwarting any attempts at ever reaching the perfect bikini body. Join me on a foray into a world of baking.